The Hardware Design Workshop covers the necessary fundamental concepts involved with Hardware Designing, reducing reflection and noise in an electronic system. Upon successful completion of the course, the participants will have understanding and skills required for Hardware designing. Hands-on sessions are included to reinforce and apply the knowledge and information. 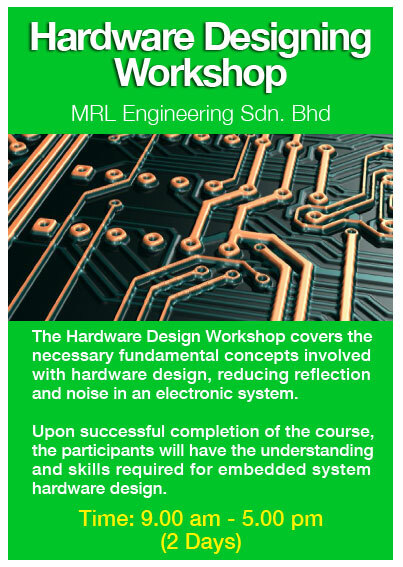 Participants will have opportunities to learn the general knowledge on Hardware products developed by MRL Engineering. The products range offered by MRL Engineering Sdn. Bhd. includes WaterTech SCADA System, Safety and Security Solutions, InfraTech SCADA Solutions and Renewable Energy Solutions.